Every morning for the last six weeks, Dorsey High School senior Christian Moton has been taking part in a highly charged and energetic morning ceremony when he sings, chants and cheers. “They host Harambee here. Harambee really brings out people’s spirit,” Moton told LA School Report. The daily Harambee, which means “all pull together” in Swahili, is part of a Children’s Defense Fund program called Freedom Schools, an educational curriculum that helps teach a love for reading and writing and builds self esteem through positive reinforcement. Organized by the Community Coalition, a group that works towards improving south LA neighborhoods, the program serves nearly 120 African American and Latino youth from elementary, middle and high schools, mostly from LA Unified. The coalition has been running the program for the last four years. 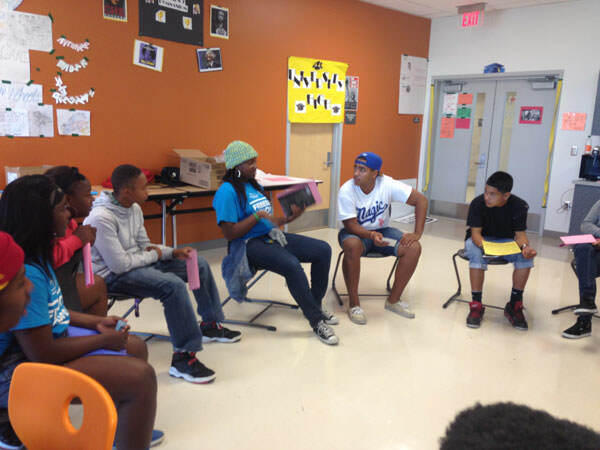 “It’s all about encouraging them to build their critical thinking skills to give their opinion and really preparing them to engage in the classroom the way most of us don’t learn until we get to college,” Sandra Hamada, director of Youth Programs at the Community Coalition told LA School Report. During the seven-week summer program, which has been expanding on the West Coast, students gather in groups and read for three hours a day. They also sing and discuss the book’s meaning, while at the same time gaining a sense of self worth. “We read out loud here and it helps because I know later in life, in college, that I’m going to have to read aloud in groups and I know this is going to prepare me for it,” Moton said. And thanks to the program’s high impact curriculum, Moton says he has grown more confident and has developed skills that will help him succeed in life.